List of the Buncombe County Jury heard court cases in the last 3 years. **Editor’s Note for requester: We got the flash drive, but the information contained on it is not in a usable format so it will take time for us to extract and upload it. We will send payment (via cashier’s check), as well as address info., in the mail in the coming week. Editor’s note: Sunshine Request cannot always cover fees like this (below). However, since this is the first time it has occurred, we will be glad to send a cashier’s check ourselves, and will post the data when we get it back. We cannot do this immediately, but will do so next week (Wk. of 02/12/18 – 02/18/18). The North Carolina Administrative Office of the Courts provides, for research purposes, a five-year statistical raw data extract of data from the statewide Automated Criminal/Infractions System (ACIS). The extract includes criminal and infractions data from 01/01/2013 – 12/31/2017 and is provided on a flash drive. ** Editor’s Note: This reply also included an attachment (NEW-ACIS Case Record Layout.xlsx) which you may access at top left in “documents”. I very much appreciate your thoroughness! Just now, I submitted the request via NC Courts’ online form as provided by Mr. Tamer. ** Editor’s note: Request has been submitted via NCCOURTS’ online form at http://www1.aoc.state.nc.us/juddir/pages/mail/request/publicrecordsrequestfm.jsp. “Steven Cogburn (Buncombe Co. Clerk of Sup. Court), Michael Frue (Bunc. Co Attorney), Todd Williams (Bunc. Co. DA), Patrick Tamer (NCJB), and Ryan Stone (NCJB) are all aware of this request. Patrick advised that I submit via your online form. We recently received a request for info that may be available in your office. Please note that the request should cover the time period of January 1, 2015 – January 31, 2018. I am forwarding the response we got from the AOC. They require the request come from the party seeking the information. I am still waiting to hear from my inquiries around the courthouse. Our office received a records request for a list of cases, both civil and criminal, between 1/1/2015 and 1/31/2018 that were disposed of by a jury trial. Is there a way for us to run a program to produce such a list/filter or is this something that can be done by AOC? We would be looking for cases using the criminal disposition code JR and civil disposition code TRJR. Thank you for the assistance as always. Please have the original requestor complete the appropriate request form below. It needs to be the original requestor, it should not come from your office even if someone else asked you for it. Note: North Carolina public records laws do not require agencies to produce records not in existence at the time of the request. G.S. 132-6.2. Note: if the request is not solely for the purpose of their work with the Judicial Branch and the report doesn’t exist at the time of the request it is likely state resources won’t be expended to create it. Thank you very much for your assistance. We appreciate you! The information that you seek is not in a specific list. There are codes that are entered into the court data base for criminal cases but that information would be in Raleigh at the Administrative Office of the Courts. I have reached out to the Trial Court Administrator to see if he has a list of the civil cases that were resolved by a jury. The TCA does not have a list but will check to see what calendars he might have available. I will send you more information after I have had a chance to look further. The problem for this type of request is that each case is treated separately and therefore we do not have a “list”. I will also query the Jury Clerk on whether she has some information. We recently received a request for information that both Michael Frue, and Todd Williams advise may be available in your office. ** Editor’s note: Please note that the requester has filled out a field on our site indicating that the request should also cover the time period of January 1, 2015 – January 31, 2018. 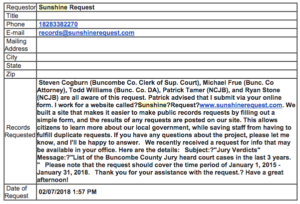 ** Editor’s Note: Sunshine Request obtained the email address (steven.d.cogburn@nccourts.org) for BC Clerk of Superior Court, Steven D. Cogburn, by calling phone # (828) 259-3400 as listed on BCGov’s website. We spoke to an operator who provided the information. In North Carolina a complete transparent record of all proceedings in our courts both jury and non-jury is kept by the Clerk of Court, not the District Attorney. The duties of the Clerk are defined by NC Statute at NCGS 7A-109 — “Each clerk shall maintain such records, files, dockets and indexes as are prescribed by rules of the Director of the Administrative Office of the Courts. Except as prohibited by law, these records shall be open to the inspection of the public during regular office hours, and shall include civil actions, special proceedings, estates, criminal actions, juvenile actions, minutes of the court, judgments, liens, lis pendens, and all other records required by law to be maintained.” The duties of the District Attorney are set out in a separate statute and the NC Constitution and do not include record keeping that is responsive to your request. In general, criminal case materials, documentation and evidence in the possession of the Office of the District Attorney are not public record per NCGS 132-1.4 (a). There are multiple reasons for this, but chief among them are to encourage the truthful reporting and investigation of crimes and to protect the rights of those accused of violating the law. Moreover, pursuant to Rules 3.6 and 3.8 of the NC Rules of Professional Conduct for lawyers, prosecutors are obligated to refrain from making extrajudicial statements that may “materially prejudice an adjudicative proceeding” and statements that are likely to “heighten public condemnation of the accused”. For good reason, trial records are maintained by the Clerk and the Administrative Office of the Courts; when this Office needs records of the type sought in this request, we get them from the Clerk or AOC. Other than the foregoing, the Office of the District Attorney is not in possession of records or documentation that is responsive to this request. Do you happen to have Steven Cogburn’s email address? There doesn’t seem to be one listed online. Buncombe County does not maintain records responsive to this request. These records are maintained by the North Carolina Administrative Office of the Courts. Locally, the Office of the Clerk of Court might be an appropriate contact. I will be at the county attorneys’ conference on Thursday February 1st and Friday, February 2nd. If you need immediate assistance please call 828-250-4100. Thank you.